Four years into my plant-based lifestyle, I thought I’d reflect on the experience and write about a topic I’ve not shared much about on Beantown Kitchen. I am also very lucky. I was cured of melanoma about five years before adopting a whole foods plant based (WFPB) diet. But having had melanoma once, I am at increased risk of recurrence. What to do to mitigate my risk? Over the years, my doctors have suggested sunscreen, mid-day sun avoidance, annual checkups and vigilant skin self-checks. Never was diet mentioned as part of the cancer prevention equation. a variety of vegetables, beans and grains. If asked about a plant-based diet at the time, I might have opined that it was pretty extreme and, potentially, an inadequate source of protein, calcium and iron. After all, I studied Nutritional Science at Cornell as an undergraduate. I thought I knew about these things. I was in for an eye-opener. Many people come to a WFPB diet after watching documentaries about the health benefits of eating this way. For me, I was moved by the film Earthlings which examines the ways humans use animals. It’s pretty grueling to watch. I did manage to get through it, but not unchanged. I started the film as a carnivore and by the time the final credits rolled, I was plant-based. enrolling in the T. Colin Campbell Center for Nutrition Studies certificate program. I binge borrowed and purchased cookbooks and embraced the challenge of bringing plants to life with all new flavors and textures. Before I knew it, I was enjoying pancakes, muffins, pizzas, burgers, stews, casseroles, cookies and cupcakes. These pics will give you an idea what I’m referring to. Not only is there no need to consume dairy for calcium and meat for protein and iron, but we are better off without them. Additionally, I learned that a WFPB diet has the components of a cancer risk lowering diet. 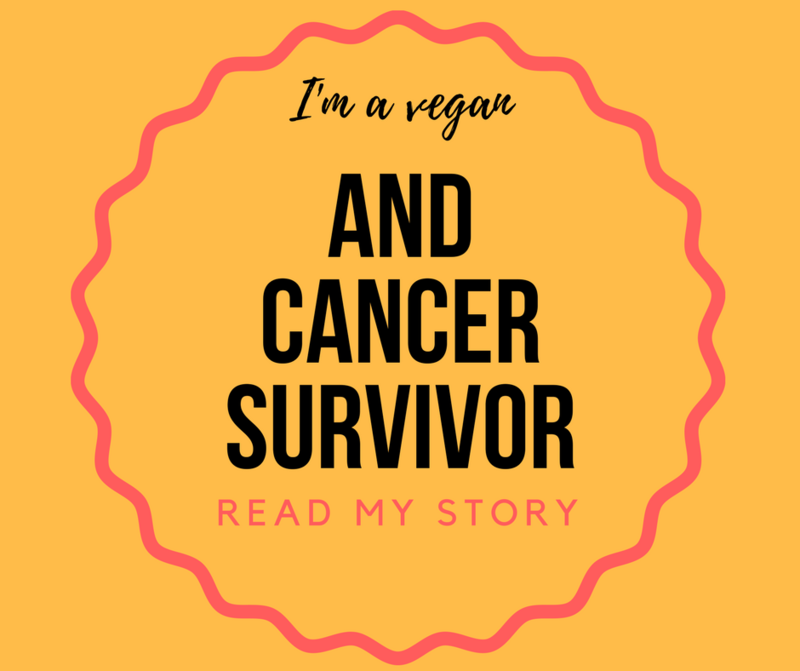 While not a panacea, I realized that as a cancer survivor it helps to avoid consuming animal products and to flood my body with plant foods, such as fruit, vegetables, grains and legumes, that are naturally high in fiber, antioxidants, and phytonutrients, while low in fat. I’m now a, not-very-fast but, enthusiastic runner, an activity I never felt energetic enough to enjoy very much prior to changing my diet. My husband, by the way, also adopted the diet (a week after me) and is a competitive triathlete who has competed in the Half Iron Man World Championships…powered by plants. While consuming the standard American diet, I had chronic sinus infections. I’ve not had one since changing my diet more than four years ago. Come to think of it, I’ve only had one cold in that time. On top of that, I find maintaining my weight, in a range I feel comfortable, easier than I did prior to the transition to this lifestyle. I am profoundly grateful for all the plant-based doctors, researchers, dieticians, filmmakers, athletes, cookbook authors and chefs who have paved the way and made it so easy for the rest of us to follow along this life changing path. The transition to a plant based diet has been one of the most joyful and meaningful decisions I’ve ever made. Thanks for reading and feel free to comment with your questions, thoughts or own experiences. I love hearing from you. Diana, what a great article! Wish I had kept in better touch with you to be supportive during your fight with cancer. Your articles inspire me so much! I’m going to watch/read the documentaries/books you mention above. Thank you for everything you do! Thank you so much Sandy! You are soooo sweet. I was very lucky that the melanoma was caught very early and one quick surgery to remove a 6 inch margin of skin around the site was enough. So nothing else was required in the way of treatment. Let me know if you watch/read anything good. There is so much great info about plant-based eating available now! Diana, I commend you for sharing your personal story. I’m even more thrilled to know you’ve adopted this diet because you are spot on. There are a rare few but successful doctors supplementing cancer treatment approaches with diet adjustments and finally many more are accepting nutritional realities of the foods cancer feeds on – in particular refined meats, shellfish and sugar, not found in things that grow out of the ground. A dear friend of mine was treated successfully for many years with a detox and nutritional protocol developed by by Dr. Nick Gonzalez a neurosurgeon with NY’s Hospital for Special Surgery. David Wolf is a useful person to follow in the education and values of “Raw Food” diets for improving outcomes with disease. Now with food supplies from various regions with vastly diverging environmental standards, we even have to be thoughtful to carefully source our vegetables, really all food. I recommend Mike Adams website naturalnews.com. The “foodreferencelibrary” is particularly enlightening as it highlights different nutritional, health, and medicinal values of different foods. I might have mentioned these sources to you previously, but I thought they might be useful to others following you. Herbs play an important role in health as well and without making things for ourselves many of us had lost the many health benefits derived from using fresh herbs – a lost art, but one a professional designing meals may be able to help us regain. I’m so impressed by your videos and so appreciate your sharing this pursuit and your recipes with us in a way that is so easy to implement and follow. Thanks so much! I will check out all of the sources you referenced. I so appreciate you sharing them!! On a personal note, I’m relieved that you are ok and so encouraged at all you’ve been able to accomplish having gone through so much physically. Sending my love and prayers for a long cancer free and fully energized life!